London is picking up the pieces after a near-Apocalypse—a comet has just missed the Earth, leaving the city in chaos. Only the blind boy oracle, Tersias, can see the future. But he is captured by Solomon, a false prophet. Fantasy for readers teen and older, by G.P. Taylor. London is picking up the pieces after a near-Apocalypse—a comet has just missed the Earth, leaving the city in chaos. The streets have taken on a frenzied air, and swindlers and circus performers have come to town to take advantage of the confusion. 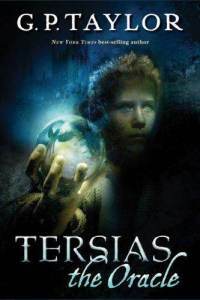 In this time of uncertainty, only the blind boy oracle, Tersias, can see what the future holds. But awareness of his power is growing, and he is captured by Solomon, a false prophet whose purple-robed minions swarm London, looking for disciples. Tersias is just what Solomon needs, and with Tersias under his control, Solomon believes he’s finally in a position to complete his master plan. Tersias is not without friends—an unlikely alliance of teenage highwaymen and a charlatan magician swear to break down Solomon’s Citadel and rescue Tersias from his clutches. They wonder if Tersias’s power can save them all—but they haven’t realized the source of his second sight, and they aren’t aware of a much darker force that torments his soul . . .
Sequel to Wormwood, fantasy for readers teen and older.